Parriott Mesa is the large mesa guarding the entrance into Castle Valley, and is easily seen along the river road (Highway 128) as you drive north. It's long, roughly 1.3 miles north to south but narrow, ranging from 350-800 feet wide. 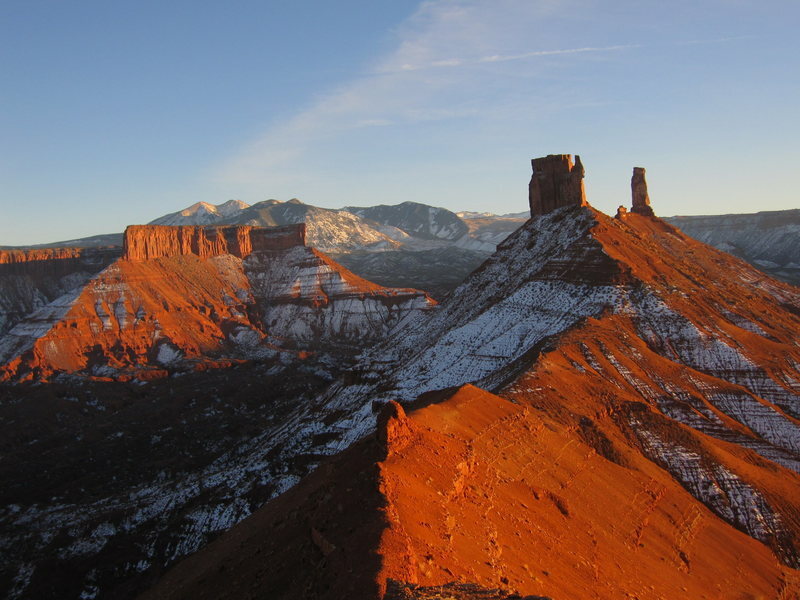 The highest point is on the southwestern corner and views of the La Sal Mountains, as well as Castle Valley below are spectacular. 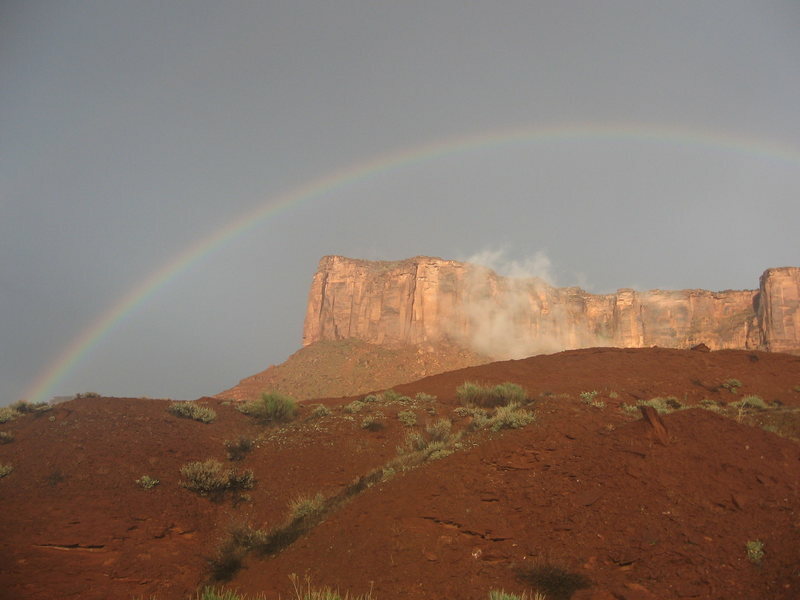 With 400 foot vertical walls guarding nearly every aspect of the mesa, the top is difficult to reach sans the northeast side which has a "scramble" route to the top complete with fixed lines. Besides that, there are a handful of established crack climbs in the 5.10 or greater difficulty range, and the opportunity for many more. Few people venture to Parriott Mesa so relative solitude can be obtained. The trailhead for just about any climb on Parriott Mesa is located just off the Castle Valley paved road, and is easy to find, despite it being unofficial and unsigned. From Moab, drive north out of town on Highway 191 and just before crossing the Colorado River bridge, turn right onto the river road (Highway 128). Follow this road along the south side of the river for 15.5 miles and turn right on the signed Castle Valley Road. Follow this paved road for 3.3 miles as it climbs a small hill and drops into Castle Valley. Locate a small dirt on the road on the left at 3.3 miles and drive 300 feet to where it forks. Take the left fork and go an additional 300 feet to a tree where a small gully crosses the road, preventing further passage by a normal passenger car. With a 4WD, you can continue another 600 feet to the end of the road at the base of the steep hill above to the north. The trail heading east traversing up this hill is easy to find, and marks the start of the approach to Parriott Mesa. The standard route to the summit involves a nice hike on a well cairned path, a few low 5th class chimneys and fixed ropes. From where ever you parked, hike the rest of the dirt road to the start of the trail and follow the trail east, traversing up the hill for 250 feet where you'll reach the crest of the ridge. Switch back and follow the top of the ridge back to the west for nearly a half mile until the trail reaches the base of the large scree fan and talus slope on the east side of the mesa. 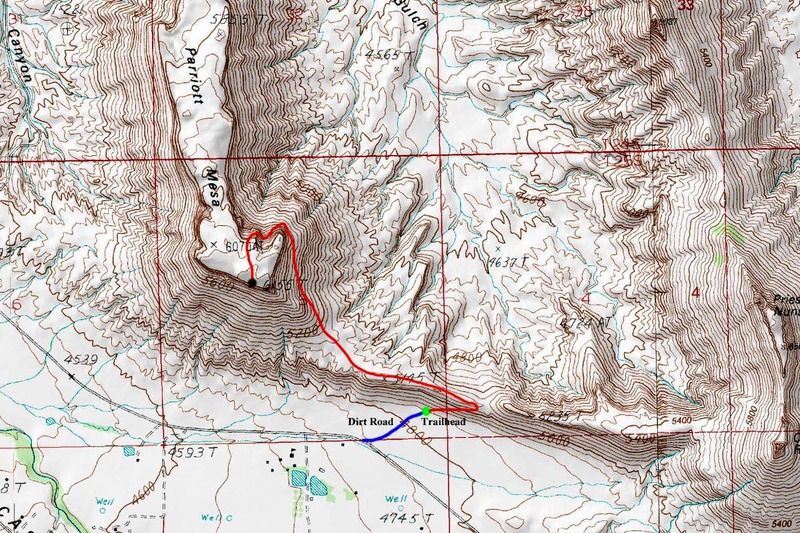 Follow the well cairned trail as it makes a northwest ascending traverse of the talus slope, and wraps around to the north side of the mesa upon reaching the base of the vertical cliff. Some short third class sections are needed to round to the north side, but the route is easy to follow. Surprisingly, a series of bowls cut into the north side, making the north side drastically less imposing. When you reach the north side, the trail continues up the bowl up more talus and reaches a small metal cable, bolted into the wall that you can use to help you make an airy 25 foot traverse. On the other side of this traverse, you'll reach the base of a 40 foot chimney with at least two fixed lines. This chimney is the crux of the route and most people use a prussik cord around one of the fixed lines as the climb up for protection in case of a fall, which would be certain death here. Once above this chimney, the trail then follows into a second bowl just to the west. A small but airy step is passed, where a short piece of rope is placed you can grab into. Then you'll reach a narrow deep chimney at the apex of this second bowl, and in November, 2014 there was no fixed line in this chimney. Climbing it however was mostly 4th class with the start the hardest part. Use the deep pockets for holds to get up the first 10 feet, then easy but steep scrambling for another 20 feet bring you to a ledge. You'll probably notice the bolt as well. Once on the ledge, traverse right a short distance and locate the final handline and scramble/mantle up a few steep blocks and emerge onto the summit plateau. From here, it's roughly 700 feet of walking southwestward to the highest point, marked bu a large cairn. Make sure you remember where you reached the mesa top, and retrace your steps on the descent. You can rappel the fixed lines, but only the first chimney (crux) actually needs rappelling. The rest can certainly be down climbed fairly easily. See the map below for a visual representation of the route. 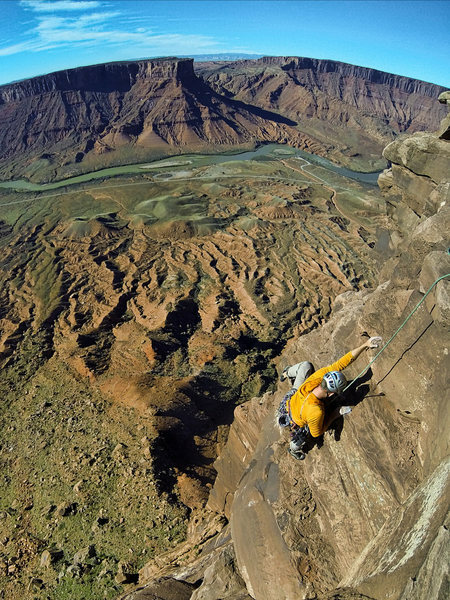 For the standard route on Parriott Mesa, make sure you at least bring a harness, rappel device, a couple prussik cords, and a personal anchor of some kind. You may also want to bring a 30 meter rope and extra slings in case the handlines that are there become tattered and aren't good enough to rappel off from. There are a few high quality established rock climbing routes on Parriott Mesa. I've listed some of them below, however this is by no means a complete list. There are probably countless potential FA's and others that have been done. 5.10 A0 R West This route climbs the obvious large crack on the SW corner of the mesa, up the prominent buttress at the apex of the west and south faces. It is shown at right center in the photo. The route goes at 5 pitches and rises just under 400 feet. Descend the standard route. 5.8 A1 This route is actually on Crooked Arrow Spire at the far north end of the mesa. The approach is not the same as the standard route. The route is two pitches with the first one being very deep in a chimney and the second being a bolt ladder with 31 bolts! Rappel the route (2 ropes needed). 5.11c West This route is on the west face at the extreme northern end of the mesa. The approach is not the same as the standard route. The route rises 480 feet in 4 pitches. Lots of splitter finger cracks! Location of the route is shown in the photo at left. No red tape. Free camping can be found at the Castleton Trailhead, 1.2 miles past the dirt road for this route just off the north side of the Castle Valley Road. Camping is not allowed along this dirt road or at the trailhead for Parriott Mesa. Anytime...although mid summer will be hot as hell!